USD/INR is currently trading around 71.32marks. It made intraday high at 71.37 and low at 70.96 marks. Intraday bias remains bullish till the time pair holds key support at 70.70 mark. Key resistances are seen at 71.37, 71.75, 72.02, 72.32 and 72.47 marks respectively. On the other side, initial supports are seen at 70.96, 70.70, 70.49, 70.23, 69.82, 69.60 and 69.35 marks respectively. India’s NSE Nifty was trading around 0.70 percent lower at 10,672.58 points while BSE Sensex was trading 0.60 points lower at 35,672.92 points. 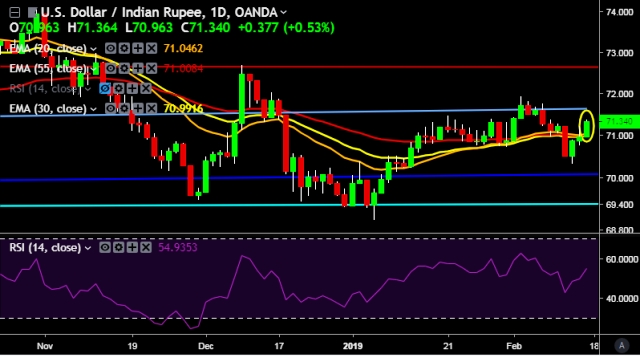 We prefer to take long position on USD/INR around 71.20, stop loss at 70.95 and target of 71.37/71.75.